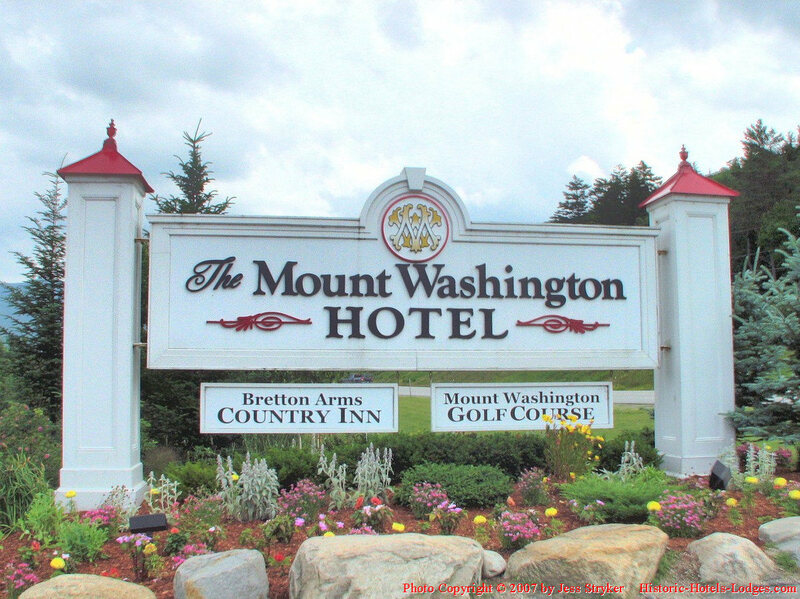 The Mount Washington Hotel is located in the White Mountains of New Hampshire. The hotel opened in 1902, and was built to be a luxurious hotel for the wealthy. 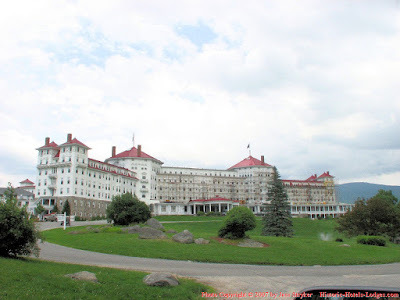 Many famous people have stayed at the Mount Washington over the years. A major $50 million renovation of the property started in 2007 that will upgrade the entire hotel, add new convention and spa facilities, and rebuild the golf course. The Mount Washington Hotel is a National Historic Landmark, a recognition only given to properties that have made significant contributions to both architecture and history. While not on a major tourist route, the Mount Washington Hotel is a truly impressive hotel that is well worth going out of your way to visit! These photos are from our visit on Monday, July 9, 2007. 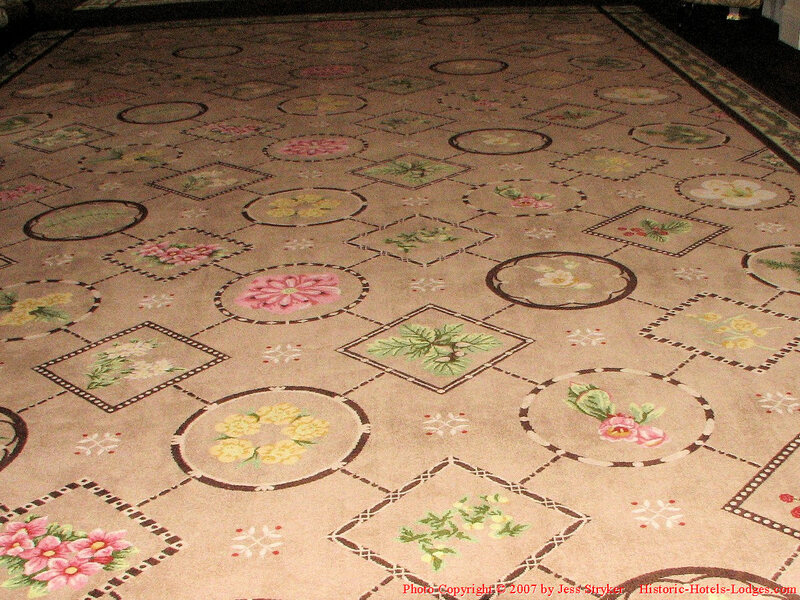 Click on any photo to enlarge and view in the lightbox. 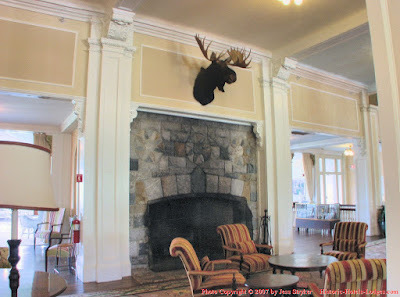 Front exterior of the Mount Washington Hotel, Bretton Woods, New Hampshire. 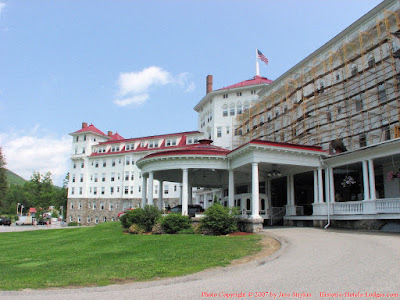 The Mount Washington Hotel was constructed by railroad tycoon Joseph Stickney (of the Pennsylvania Railroad). Construction started in 1900 and the hotel opened in 1902. Stickney wanted a first-class hotel and brought in 250 Italian artisans to help in the construction. The original cost of the hotel was 1.7 million dollars. The hotel was built for summer operation only. Each year it opened in May, and then was closed up in October. This is the North End Tower of the hotel. Check out the fancy scroll work. 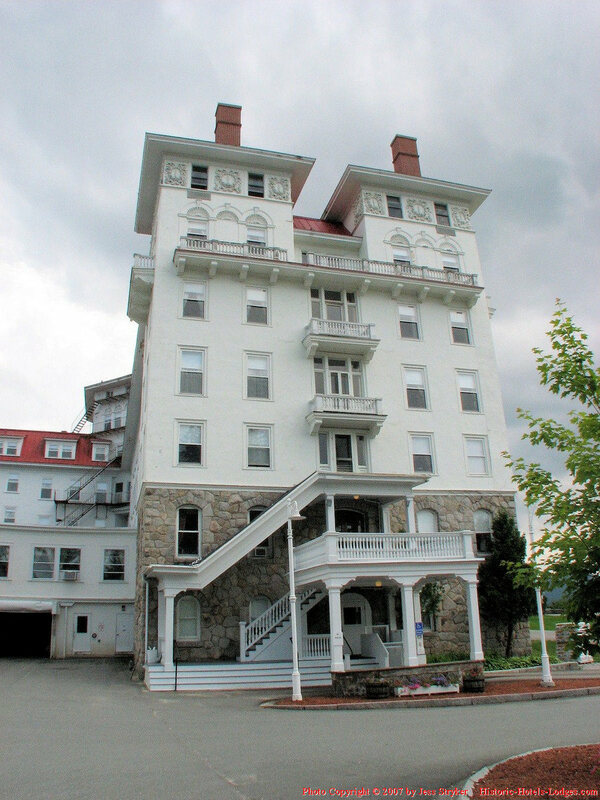 View of the rear of the Mount Washington Hotel. 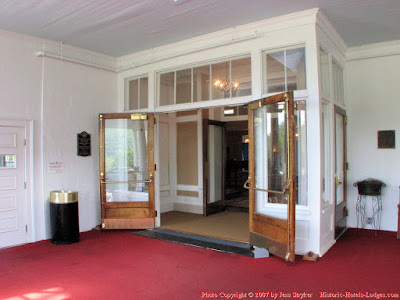 The entrance drive winds up to the porte-cochere where valets and bellhops greet you. This is the Front Veranda. 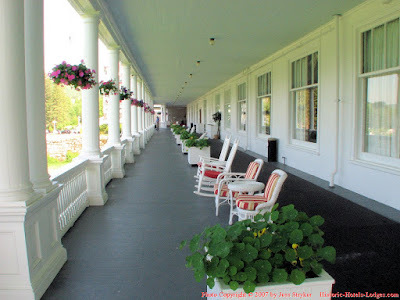 The Veranda of the Mount Washington Hotel is an amazing 903 feet long. Mount Washington Hotel, south veranda. Wide verandas wrap around 3 sides of the hotel. Here's a floor plan to help you get your bearings. Floor plan courtesy of Mount Washington Resort. The main entrance to the hotel (this is the left door). Unimpressed? That's the idea! Note the rather plain front doors. This is an architectural trick. While driving up to the hotel you would certainly be impressed, and possibly even over-whelmed, by the massive exterior. The unimpressive front doors provide visual relief, a moment for your eyes to rest, and a lowering of expectations. The result is that when you step through the doors and see the Great Hall just inside, the hall seems even more impressive! 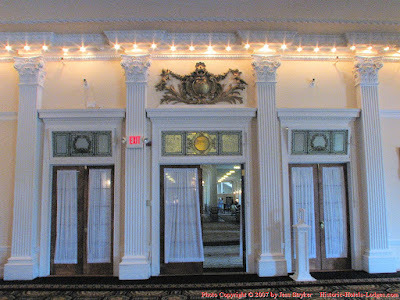 The Great Hall at the Mount Washington Hotel. One of the most spectacular, elegant hotel lobbies in the world! Moose head over the fireplace in the Great Hall. 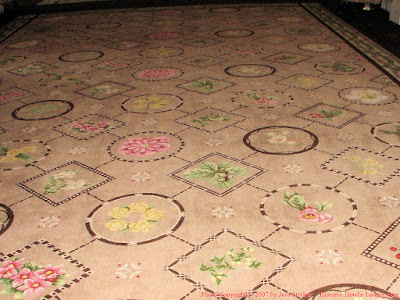 The carpets in the great hall feature flowers that are indigenous to the hotel area. The half circle shaped Conservatory on the back hotel behind the Great Hall. 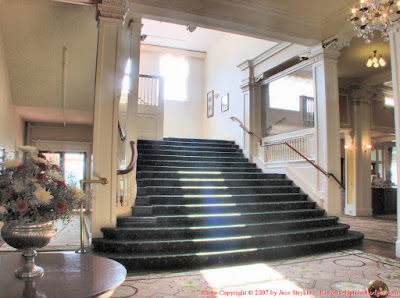 Joseph Stickney passed away in 1903, shortly after the hotel opened, and the operation of the hotel was assumed by his widow, Caroline Foster Stickney. In 1908 Caroline remarried to Prince Lucinge of France, making her a princess. She later acquired additional hotels in France and Switzerland. She operated the Mount Washington until her death at which time her nephew, Foster Reynolds, took control of the hotel. At one time this was an actual balcony. It overlooks the hall leading to the Dining Rooms. The balcony opened from one of the Princess' private rooms behind it. 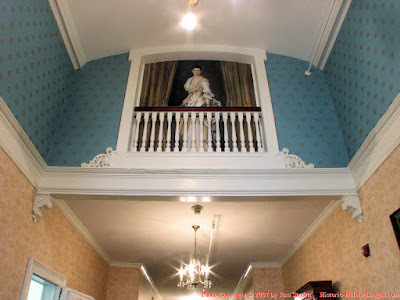 The room has now been walled off, and this painting of the Princess (Caroline Foster Stickney) now graces the balcony. From this balcony she used to watch her guests as they arrived for dinner. A shear curtain allowed her to see out but prevented them from seeing in. When guests were invited to dine with the princess, it would seem she always was the best-dressed lady at dinner. This was no accident, as she always was the last to arrive for dinner. She watched her guests arrive from the balcony of a darkened room (photo above), looking out through a sheer curtained window that allowed her to see out, without them seeing her watching. She would then pick her outfit for the evening after seeing what the other ladies were wearing! The Main Dining Room at the Mount Washington Hotel. 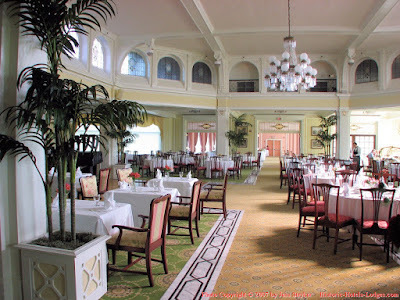 Most of the furniture is the original furniture from when the hotel opened, and the carpets are a replica of the original carpet. The upper level clerestory windows are Tiffany stained glass. 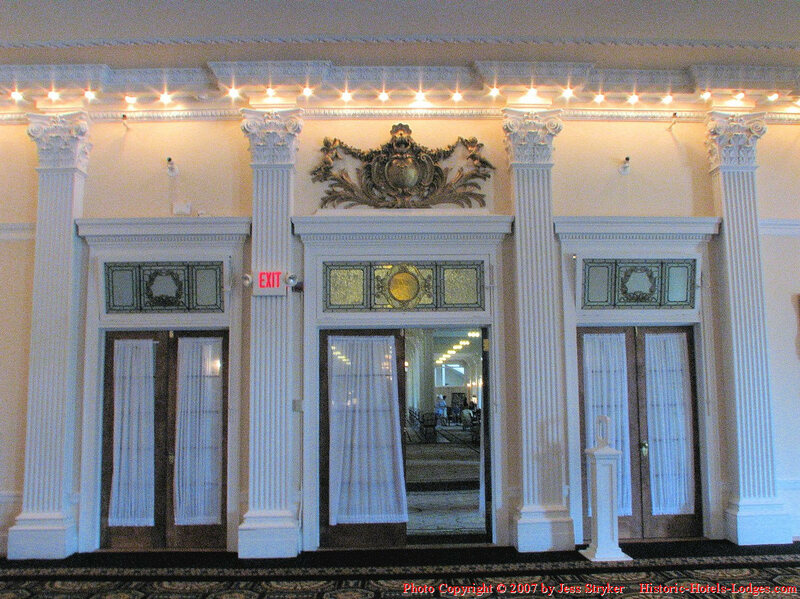 The ballroom doors viewed from inside the ballroom. Through the doors is the Great Hall. The colored glass transom windows are original and are genuine Tiffany glass. In 1944 delegates from 44 countries met here for the Bretton Woods International Monetary Conference. The World Bank was established and a gold standard of $35.00 (USD) an ounce was set at the meeting and remained the standard for 25 years. The hotel had fallen on hard times through the Great Depression and fallen into disrepair. In addition it had been closed since 1942 (due to World War II), so it needed to be completely refurbished for the conference. Government workers were sent to paint, repair and clean. The repairs served as a kick start to getting the hotel ready to reopened to the public again in 1947. The Famous Gold Room where delegates met for the Bretton Woods International Monetary Conference in 1944. From the Great Hall this is the main staircase heading up to the guest rooms. A upgrade double guest room. Note that rooms are often remodeled, so current appearance may vary. 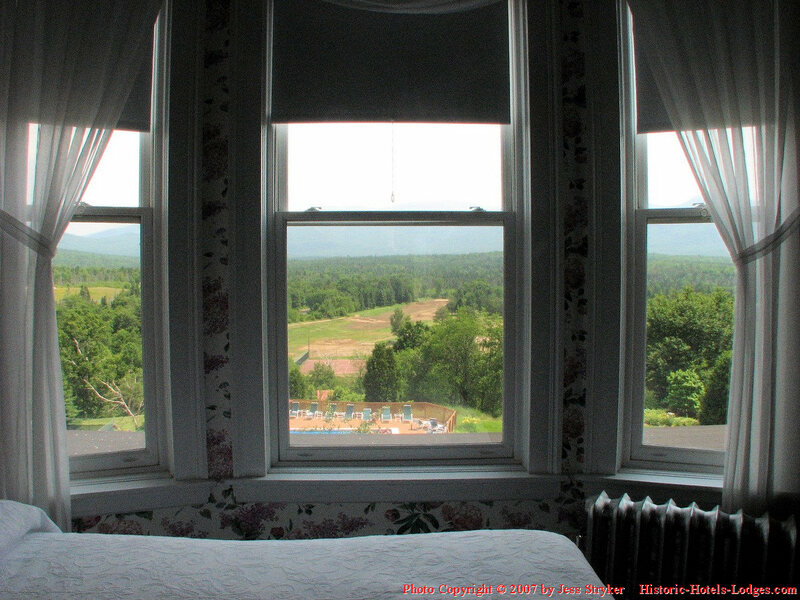 The depression brought hard times for the Mount Washington Hotel. The Mount Washington survived, but suffered and fell into disrepair. 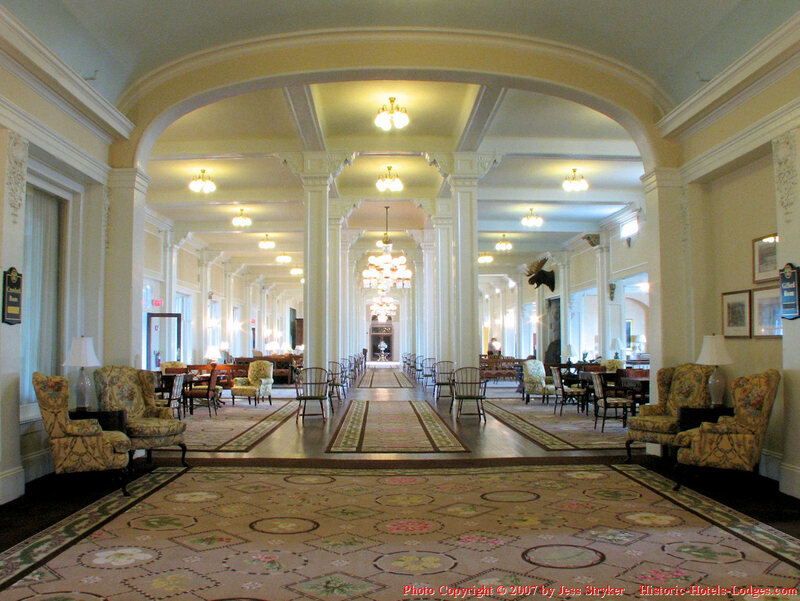 Finally in 1942, at the outset of World War II, the hotel was closed. The now closed hotel was sold in 1944 to investors from Boston who remodeled it, with help from the government, so that the Bretton Woods International Monetary Conference could be held at the hotel. The hotel reopened after the war. Since that time the hotel has passed through a series of owners, with both up and down periods. Beautiful view from the window. Another room with a single king bed. 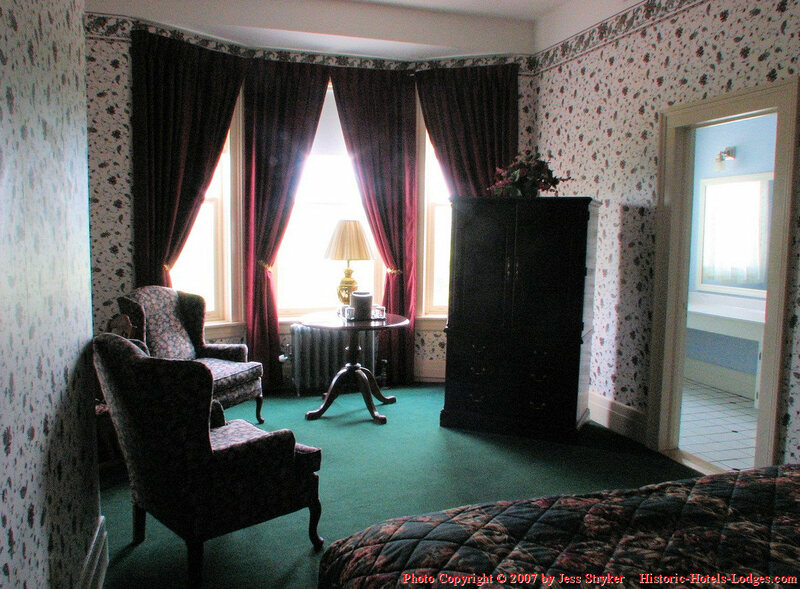 The Princess Suite, room 314, was one of Princess Faucigny-Lucinge's rooms at the hotel (she moved around from room to room over the years.) The four poster bed in the photo was her favorite, she would not sleep in other beds. 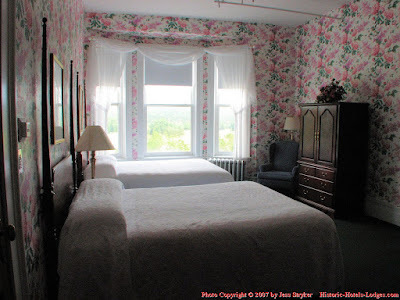 When she changed rooms or moved to one of her other hotels at the end of the season, the bed was disassembled, boxed up, shipped to the new location, and then set up in her new room prior to her arrival. So called "Stickney Street" is the hallway that extends most of the length of the patio level (the lowest public level.) Historic photos of the hotel line the walls of Stickney Street. 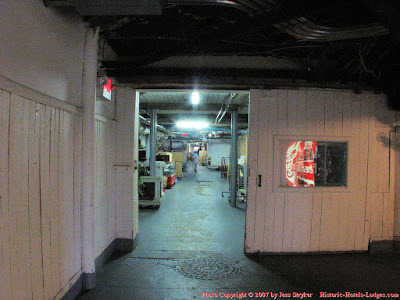 A number of things have been down here over the years, a billiard room, card rooms, bowling alley, and even a speak easy (an illegal bar during the prohibition era, when alcoholic beverages were illegal here.) At the time we visited there was an ice cream shop, gift shop, Kid's Camp (day care), and a real estate office down here that I didn't photograph. The gift shop was originally the Ladies Card Room. 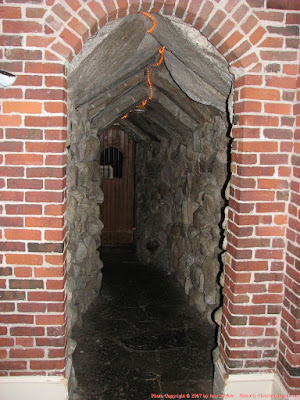 The bricks are facing only, the actual walls are constructed of granite. 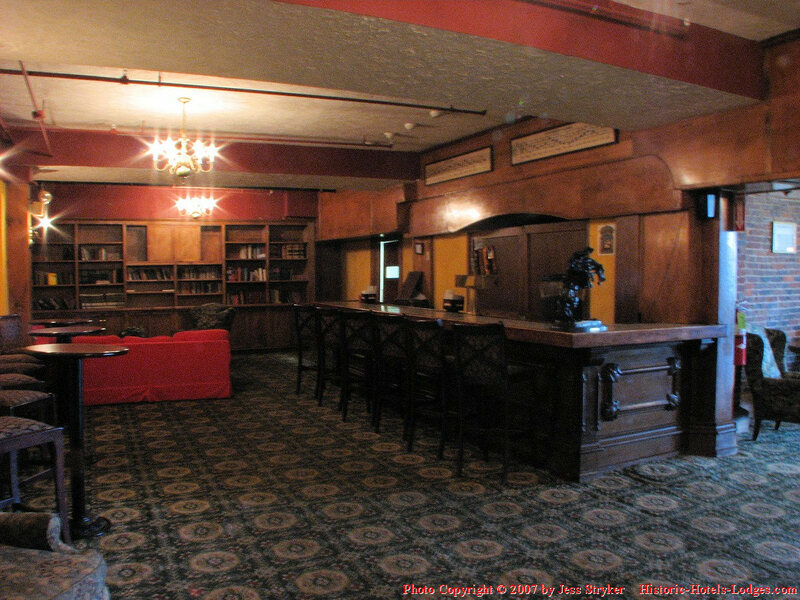 This is the bar in Stickney's Lounge & Restaurant. 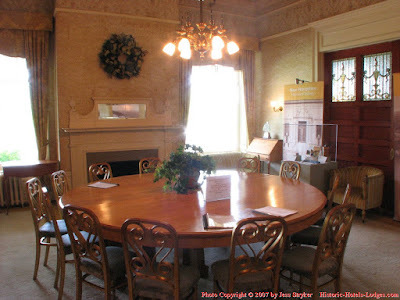 Originally this was the Men's Billiard Room. 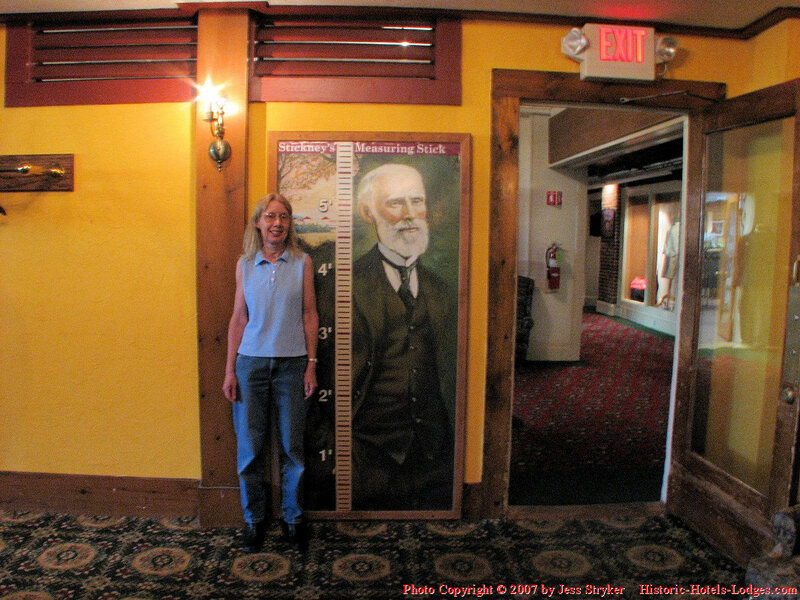 The Stickney's Lounge features "Stickney's Measuring Stick" on the wall. The stick is a joke, check your height on it and you will find you have shrunk by a couple of inches! Getting your picture taken with the stick is a tradition. 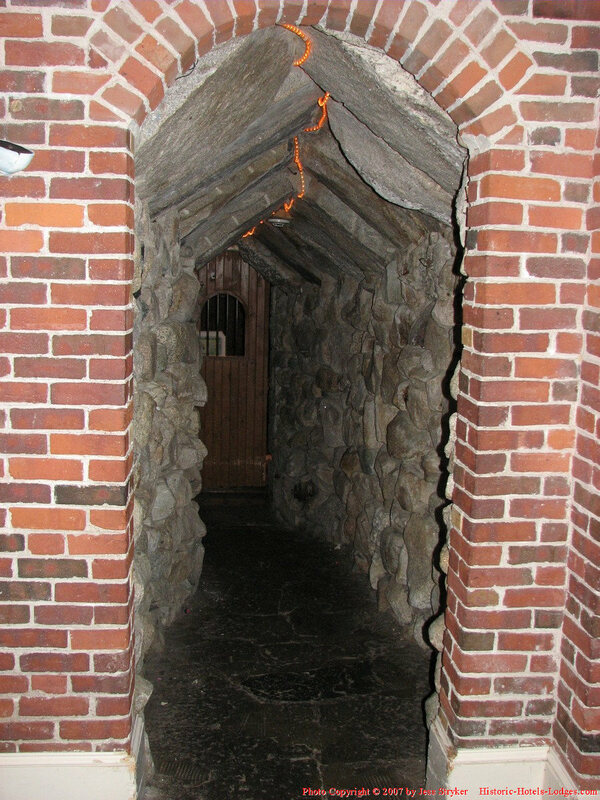 Entrance to The Cave. 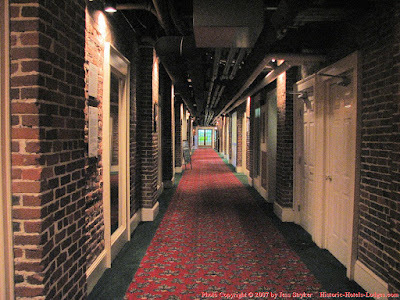 Why the narrow hallway entry? 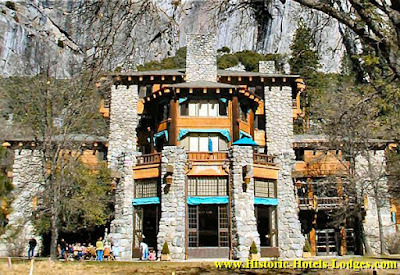 If you look at the floor plan you will notice that the Cave is tucked out of sight under the front porch of the hotel. It was a "speak-easy" during prohibition, so they didn't want it to be too obvious! 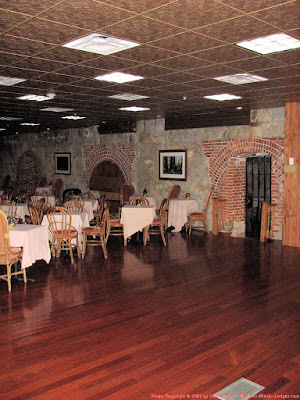 The Cave lounge, located under the front porch of the hotel. I'm not encouraging you to sneak around or stick your nose in places off-limits, but I always do, and I try to grab a photo of something that isn't "public." At the north end of Stickney Street you will find a unmarked door that leads to the area under the dining room where some of the hotel's support facilities are located. Just look for a steady stream of employees walking in and out. The hotel has a staff of 300 persons in winter, swelling to 400 in the summer season.